Don't think you and your guests can make it out to the farm, or you live in the city and many of your friends don't have a vehicle, well let us know your interested and we'll come to you! Come Enjoy an Authentic Farm Family Dining Experience! 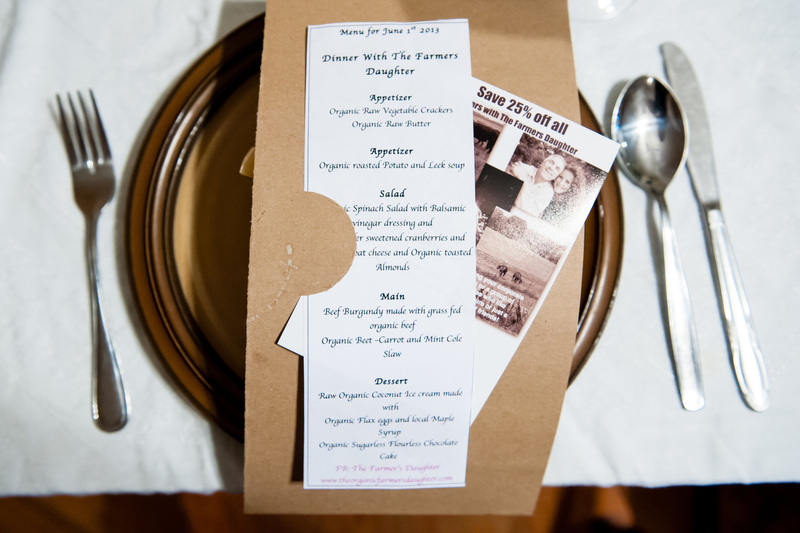 Something truly out of the ordinary and for the real foodies out there, your experience wouldn't be complete without a real on farm dinner prepared with products directly from the farm - as LOCAL and organic as it gets! Food grown for micro nutrient density and prepared by our Chef - Scott Yates, a well known and passionate chef who has a unique ability to transform raw carefully raised products into works of art that are sure to delight your taste buds and tummies! Dinner with The Farmers Daughter will enlighten you to many traditional ways of preparing food, as well as special little facts about food and perhaps the heritage and stories behind the food. Sign up below for one of the Open Seatings - bring your loved one, or loved ONES, enjoy company with other foodies, a small farm tour and a dinner overlooking the pasture as the sun sets in the distance and the cows graze. We are booking into September and early October now for dinners! Please use our contact form to inquire about bringing a group out for a family gathering or even an office work party. We can accommodate corporate groups with some very fun and unique team building activities. Be sure to check out our event calendar below!